Pat crumbs into the prepared pan by hand and bake 10 min, cool on rack. Wash and drain berries, set aside. In a small bowl, combine white sugar and cornstarch, set aside. 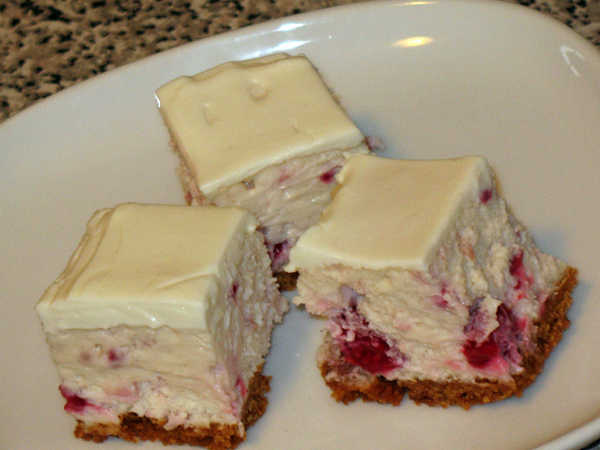 In mixer on Medium speed, beat cream cheese for 5 minutes, scrape down sides every 60 seconds. Once the cream cheese is beaten, stir in sugar mixture, followed by the eggs, one at a time. Beat in half of the berries until you see red streaks in the filling. Pour half of filling onto crust, top with remaining berries, then top with remaining filling. Set cake into bain marie and bake 50 minutes. Make topping: in small bowl mix together sour cream and sugar. Spoon onto hot cake and spread with a soft spatula. Slice using hot knife method, and let pieces stand 5-10 min before serving.